FIANNA FÁIL LEADER Micheál Martin has been reluctant to congratulate Mary Hanafin on her success as it looks like she is set to take a seat in south Dublin alongside Kate Feeney. The two candidates were at the centre of an awkward row which raised questions about Fianna Fáil’s leadership, but now it now looks like both will be elected. 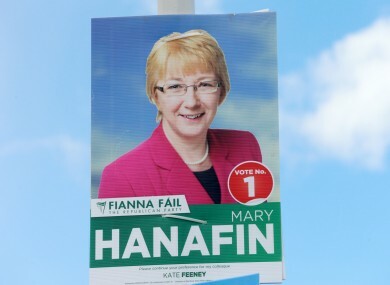 Hanafin remained a candidate despite repeated calls from Martin for her to withdraw after her late arrival on the ticket prompted by reports that Feeney was polling badly. “I was told a long time ago that a good row in politics can do wondrous things in the next election,” he joked. While he acknowledged that “Mary Hanafin has done well”, he made a point of congratulating Feeney, saying he was “delighted” for her and she showed “great courage and great nerve”. “You’ve been through a baptism of fire and you stood up to it,” he said. Martin told RTÉ that Hanafin will likely still face disciplinary action for going against the party’s decision. The latest tallies for the Blackrock local electoral area show the former Minister for Education is on 14.4 per cent, with newcomer and president of Ógra Fianna Fáil Feeney on 12.4 per cent. Both are behind front-runner Marie Baker of Fine Gael who is on 17 per cent, but ahead of the remaining eight candidates. There are six seats on Dun Laoghaire-Rathdown Council on offer in the area. Hanafin is projected to have 1,527 first preferences with 1,308 for Feeney. Hanafins transfers are likely to push Feeney over the line. The first count is expected within a few hours. The valid poll is 10,953 votes with the quota set at 1,513 votes. Email “Micheál Martin is delighted for Kate Feeney...and Mary Hanafin did well too”. Feedback on “Micheál Martin is delighted for Kate Feeney...and Mary Hanafin did well too”.